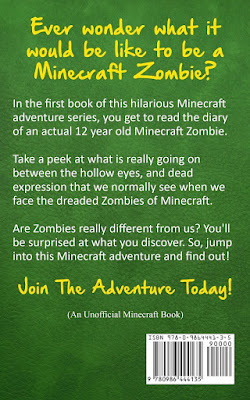 In the first book of this hilarious Minecraft adventure series, we get to read the diary of an actual 12 year old Minecraft Zombie. So, jump into this Minecraft adventure and find out!. 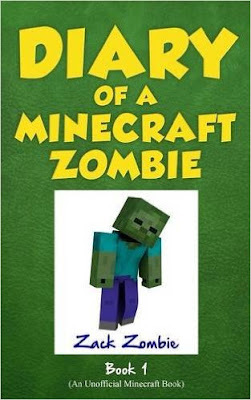 Diary of a Minecraft Zombie is a must-read for any kid who loves Minecraft. My 11 year old son isn’t much into reading. Unless it is something of interest to him, such as vehicles, astronomy, or Minecraft. Those are a few subjects that he is willing to read about. So, when we received the ‘Diary of a Minecraft Zombie’ Book 1, I was really excited by the opportunity to hand him a book that he would actually read and definitely enjoy. The chapters in this book are displayed as days instead of chapters. The book is presented as, and written to resemble a real diary. The day-chapters are short and very easy to read and understand. Throughout the book, you are reading from Zack Zombie’s point of view. It covers subjects about his middle-school life, along with his friends. You not only reading about Zack Zombie, but also his friends; Skelly, Creepy, his family, and his only human friend Steve. There are simple black and white pictures throughout the story, here and there as you read through the pages. The drawings look like Zack Zombie himself drew them at home. Not only did my son read the book and like it, but I caught myself liking the book when I read it. Zack Zombie is not scary at all, he is a very likeable character. He is quirky and funny in his own way. There is nothing violent about the book, which is nice if your kid may be on the younger side. We found the book to have several funny parts that actually made my boy and I BOTH laugh out loud. My son knows a lot about Minecraft, so he understood a lot more about certain topics than I did. However, that didn’t stop me from enjoying this book at all. I found it quite entertaining. If your kiddo is a Minecraft fan, this is such a great story for them to read. The best part about this book is that it was a rewarding read for my son. I feel like this might be a first step in encouraging him to pick up a book instead of the controller for his game-system or television.